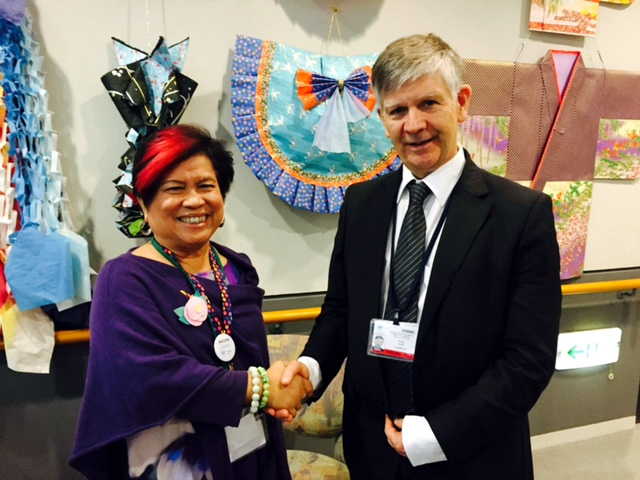 16 March 2015, Sendai – Social Welfare and Development Secretary Corazon “Dinky” Soliman today conveyed to Envoy Professor Walter Kaelin of the Nansen Initiative (NI) the continuing support of the Philippines for the NI advocacy of establishing and advancing principles on cross-border displacement of people including OFWs and migrants due to natural disasters and climate change. 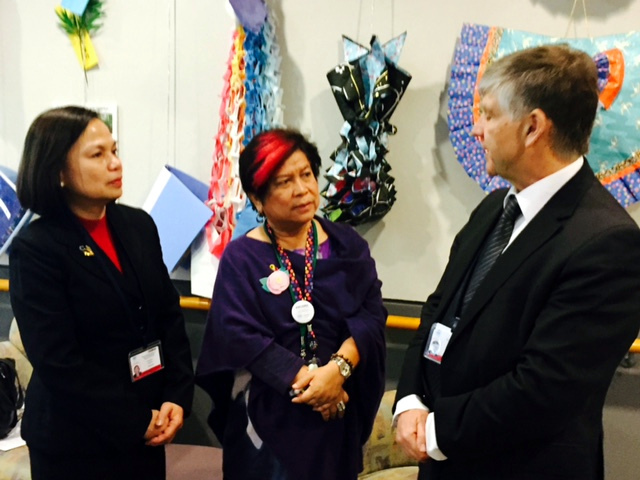 Secretary Soliman, who is Head of the Philippine Delegation to the 3rd United Nations World Conference on Disaster Risk Reduction (3WCDRR), 14-18 March 2015, Sendai, Japan, held talks with Prof. Kaelin (1st right) at the sidelines of the 3WCDRR in the Sendai International Conference Center. She was joined in the meeting by Ms. Margarita R. Songco, Deputy Director General National Economic and Development Authority (1st left). Prof. Kaelin gave a brief update on the NI’s consultations with stakeholders/partners and developments in the hoped-for principles and guidelines on the cross-border displacement of people. He also discussed the possible way forward on the NI after its conclusion in October 2015 including a new mechanism in the inter-agency Global Migration Group, UNHCR or IOM, and the forming of a group of interested states to continue the process, like the existing Steering Group that includes the Philippines as a member. Prof. Kaelin, a renown Swiss legal expert on refugees, extended an invitation to the Philippines to the NI High-Level Meeting in Geneva in mid-October. The Nansen Initiative is a state-led, inter-governmental and informal process seeking to forge a global consensus on principles and guidelines for addressing the cross-border displacement of persons due to natural disasters and climate change. The NI, launched in 2011, is managed by a Steering Group, a Consultative Committee, an Envoy and a small Secretariat. The DSWD, National Disaster Risk Reduction and Management Council, Climate Change Commission and DFA are the Philippine agencies liaising with the NI. Secretary Soliman assured Prof. Kaelin of the continuing support of the Philippines to the NI and its advocacy even beyond October as it seeks global action on two critical issues for the Philippines, namely, the well-being of OFWs and migrants in general, and advancement of Disaster Risk Reduction and Climate Change Adaptation.